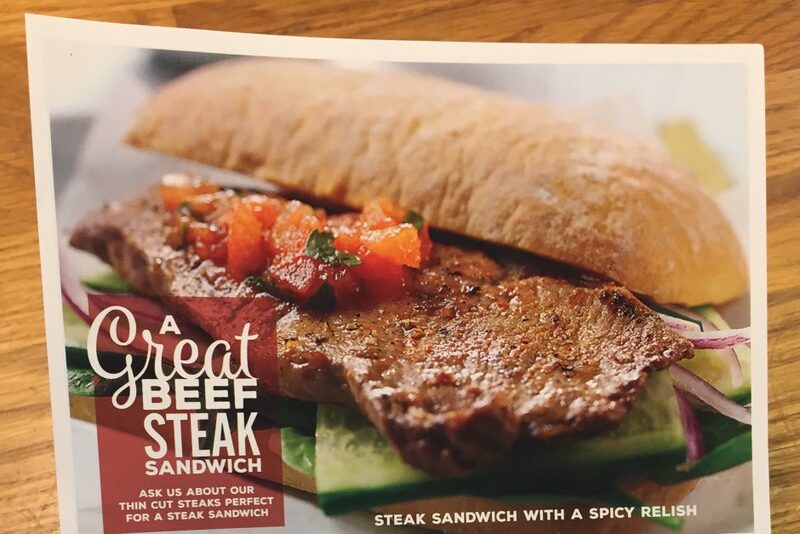 To celebrate Great British Beef Week why not try this amazing Steak Sandwich recipe – try it with our amazing Sirloin Steak Offer 2 for £10. Check out our Special Offers page. Remove the steaks from the fridge at least 20 mins before cooking. Transfer the steaks to a plate, brush with seasoning on both sides, season and brush with mustard. Cover and leave to one side. To cook the caramelised vegetables, heat the remaining oil in a large non-stick pan and cook the onions and mushrooms for 5 minutes under a low heat until soft. Add the sugar and balsamic vinegar. Cook for a further 5 minutes until caramelised. Remove from the heat and transfer the mixture to a bowl. Meanwhile, prepare the relish. In a small bowl mix all the ingredients together and set aside. Return the same pan to the hob and heat until hot. Cook the steaks for 2-3 minutes on each side (for medium). Slice thinly on the diagonal. Cut the bread in half and spread with the relish, add some salad leaves, cucumber and tomatoes. Top with the steak, caramelised vegetables and more relish. Pop the other piece of bread on top, press down lightly cut in half and serve with fries or potato wedges.